Taking Reservations for August & September "Whatever's Biting On The Reef Trips" - We're Catching Sea Bass & Flounder. There's No Possible Way To Know Which Species Will Bite Better. Both Delicious: if you only want cbass or only want flounder you can watch the swallop-barrel to see which day you wanted to go ..but that won't mean that same species will bite better again next trip!! 10,258 Total "Oyster Castle" reef blocks by the rail.. In the past week or so we've had one of the best days of sea bass fishing this season, two of our very best flounder trips ..and one of the worst catches all year.. It remains that I cannot know what's going to bite, or even if they're going to bite, until they're biting. Fishing reefs & wrecks for sea bass & flounder. Most days are a mix of both. If you specifically want one species and positively not the other I suggest you wait. Have had a dozen or so super-limits where clients had to give flounder away to stay legal. Some of those same anglers have also goose-egged on fluke while others aboard had nice catches of sea bass. The reward for hard-headedness, for not switching gears to another species, can be a can of tuna for supper.. This summer's weather offers an odd pattern of far more E & NE wind than normal. Not storm winds, most of these have been cool & pleasant. Those easterlies have pushed some nice looking clean-green, almost blue water to just 5 to 7 miles offshore. Seeing an occasional mahi in that pretty water, even caught a small bluefin about 15 miles off the beach. I anticipate we'll see other modern-day exotics. It's said that if you look around the poker table & don't know who the patsy is – you're the patsy. If you buy a ticket to my boat thinking you're going to catch mahi & bluefin . . .
Sea bass are closed in October. All of October. Sea bass are closed for most of May too. That's a huge chunk of my historical sea bass season; season once very popular with anglers. We're also down to a 15 fish limit, rarely reached. With no bag-limit until 2002 when a 25 fish limit was imposed, it was cut to 20 just a year ago. Sadly, our 15 fish limit seems generous when compared to NY & points north where they have between 8 & 3 sea bass bag-limits and even shorter seasons. In its most simple form, fisheries management theory would have the fish NOT being caught & killed in today's far-stricter regulation contributing to a vastly larger sea bass population. For instance: If we look at the average of Party/Charter landings from just the Mid-Atlantic For-Hire fishery between 1994 & 1997, that would average 3,375,000 sea bass killed annually. Compared to today's 375,000 fish average from 2010 to 2013, the Mid-Atlantic For-Hire Party/Charter trade alone should be contributing three million cbass annually to restoration efforts. Three million sea bass to the good a year given straight forward accounting. Assuming no changes in habitat, spawning production, or predation by other means, those 3 million cbass should offer a fantastically higher restoration benefit as all those uncaught cbass from previous years contribute to increased spawning production. Using simple fisheries management theory one could safely predict sea bass are, right now, at their highest abundance ever. 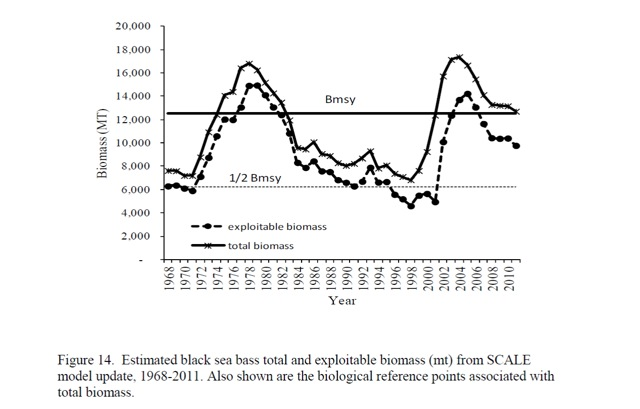 Having grown from 13 million pounds of estimated biomass in 1997 to nearly 40 million pounds by 2003, we should anticipate current sea bass populations approaching pre-industrial fishing levels – a fish population returned to a nearly virgin state: We Should Be Living The Greatest Fishery Restoration Ever. Except the population has been in decline since 2003. Earlier this season I had a client tell me that he couldn't believe how sea bass fishing had declined. A very experienced angler with many decades behind him; I agreed that the slope was steadily downward over the last decade. "Oh No!" he said, "Last year was the best year ever!" Turns out he'd been with me on my best day of the whole spring/summer/fall season and based his perception of the entire year's fishing off that single observation. Another gentleman who I deeply respect held forth on recreational release mortality thusly: No fish thrown back survive – none. In his mind catch & release is a hoax. I recently read too where an 8 sea bass limit caught in under an hour was proof positive of an effective sea bass restoration strategy. In the spring of 1997 I was eagerly anticipating the annual arrival of sea bass under their first federal regulation. Comet Hale-Bopp, long predicted and growing brighter, had been upstaged months before by the surprisingly close & bright comet, Hyakutake. Hale-Bopp enthusiasts had told one & all that Hyakutake was just a precursor, that the REAL show was coming when Hale-Bopp graced our skies. Heaven's Gate cult leader, Marshall Applewhite, recognized Hale-Bopp as an opportunity for he & his followers to escape Earth on a spaceship trailing the comet. With phenobarbital-laced apple sauce & vodka, plus a plastic bag over their heads, each of 38 suicides were assured to catch a ride to the next level of existence. Each cult member had a $5.00 bill and three quarters in their pocket to pay an "interplanetary toll." By 1997 I had already enforced a boat-regulation size limit on sea bass for 5 years. I'd already seen regulation's potential. The Mid-Atlantic Fishery Management Council (MAFMC) was just beginning their sea bass restoration effort. Once so important to commercial & recreational fishers off Maryland, I had heard about the total collapse of cod from many fishery participants. Massachusetts, having no sea bass fishery then save a small bycatch in the scup/porgy fishery, began their 1997 regulatory efforts with a 13 inch recreational size limit on sea bass and a 20 fish bag-limit. Their state's For-Hire Party/Charter 1994 to 1997 average was 2,616 total sea bass caught and landed annually – what my boat often caught daily. Certainly commendable, their effort to regulate at 13 inches while everyone else started with a 9 inch limit can be seen to backfire if a bit of consideration is given. The sea bass population doubled several times during early management, yet the State of Massachusetts's For-Hire landings are never estimated at even what a single Mid-Atlantic partyboat with good clientele would have caught in 2002 or 2003. In 2003 I wrote our DelMarVa sea bass were at habitat capacity. At that time I also noted smaller fish were not as abundant, that the waves of smalls that should be moving offshore in late October/early November were severely diminished. I thought population density was making sea bass less productive, that a natural mechanism existed to prevent serious over-crowding of reefs as happens throughout the animal world when a habitat nears capacity.. I now believe 11 inches (circa 2000/2001) was the best size limit. At that length sea bass were size-limit protected during all of age one and, for most of them, age two also. My observation of the fishery had most age one sea bass (up to 9 inches) participating in spawning then and certainly all age two. Today's 12.5 inch limit keeps those age one & two fish out of the spawning biomass. It's not the density of sea bass, it's the size of sea bass on a reef that controls when these reef fish begin to spawn. Current regulation forces all would-be spawning participants to wait until they are age three. Then they become legal. All of our region's recreational pressure is focused on sea bass just entering the spawning population. Massachusetts recently moved past this roadblock by upping their size limit to 14 inches in 2010. Assuming their sea bass behave as ours, they are protecting sea bass in their first year of spawning – protecting them through age three. We catch ours just as they enter the spawning population. 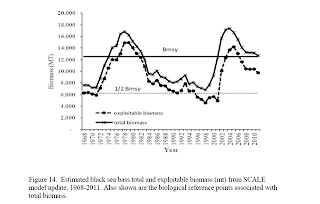 The result has been a decade-long decline in our sea bass population despite what unexamined fisheries theory would certainly anticipate as a resounding success. Starting larger, the sweet spot was never in MA's early size limits – but we sure saw it with our smaller nine, ten & eleven inch limits. It happened, of that I'm sure. But I don't think anyone at NOAA has had time or inclination to investigate. They call sea bass restored: Why Worry? How in Billy Blue Blazes management can claim victory for running a population up to habitat capacity in the first few years of regulation & then forcing it back to pre-management levels makes as much sense as trying to catch a ride on a spaceship with $5.75 in your pocket – after you've quit breathing. NOAA: "Nevermind how bright the glow of that earlier, unexpectedly wonderful and brilliant flash of restoration. No space ship there; that first comet was only a diversion. Sea Bass Industry! Real Restoration Is Coming! Here's your applesauce & bag. Don't forget your money – All Aboard! Each with just enough change in their pocket to pay a toll, Applewhite's adherents died painlessly & eagerly in search of a madman's delusions. Allowed fewer & fewer fish, with less & less season; the sea bass fishery is soon to follow. Look at the graph below. Stopping at 2011, I anticipate it will taper downward and plateau again at a lower population when updated. If anyone tells you that's a result of sensible fishery management and demonstrates a restoration – don't eat any applesauce they offer.